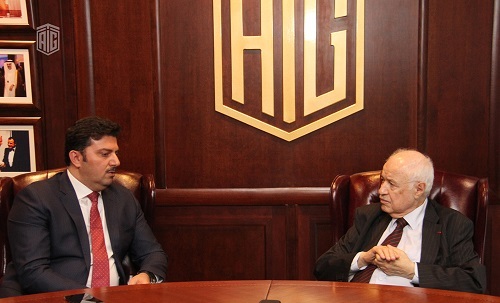 AMMAN - HE Dr. Talal Abu-Ghazaleh received in his office the President of the Arab Commission for Satellite Broadcasting (ACSB) Mr. Mohammad Al-Adailah and the Secretary General of the Commission Mr. Eyad Abu-Khorma to discuss future cooperation between the two parties. ACSB representatives requested Dr. Abu-Ghazaleh to continue as Honorary President of the Broad of Trustees following his expressed desire to resign. They also presented him an honorary shield in recognition of his invaluable efforts in serving the Commission for many years. Meanwhile, the two parties agreed to proceed with the implementation of previously signed cooperation agreements in the fields of media, information technology and intellectual property. They also agreed to sign a memorandum of understanding that incorporates other means of cooperation and services including organizing conferences and events, holding training courses, developing and creating publications among others. It’s worth mentioning that the Arab Commission for Satellite Broadcasting works under the umbrella of the Arab League as one of the Arab organizations working in the field of media and communication.